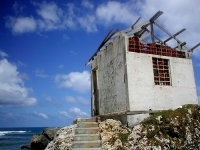 Bathsheba is home to a small community of fishing folk. Located on the island's east coast, its rocky terrain makes it a dream setting for photographers. Visitors can look forward to local rum shops, fine restaurants and one of the island's most spectacular beaches, Bath Beach. Locals know it as the 'Soup Bowl' because of its foaming surf. Discerning tourists will enjoy this Caribbean hideaway.